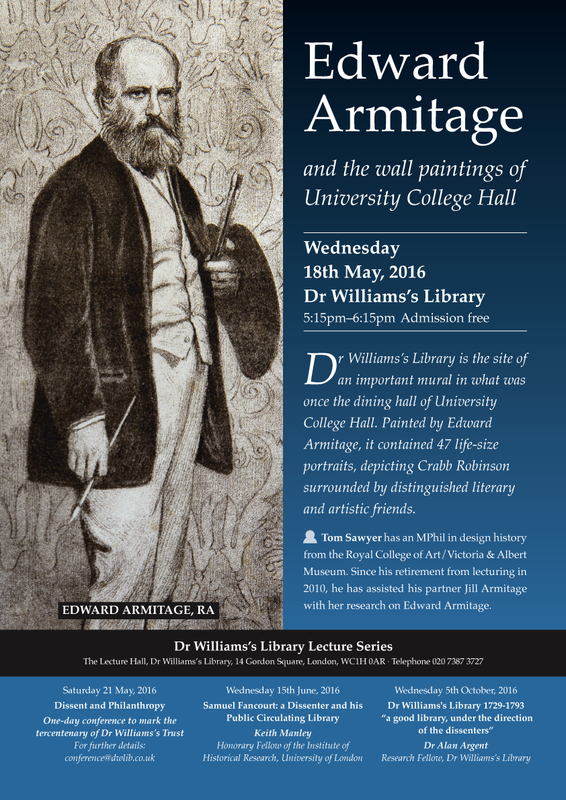 An exhibition dedicated to Edward Armitage and the wall painting 'The Vanguard of the Age'. This will be an occasion in which we aim bring Dr Williams's Library's Art Collection to a wider audience. The day will include the opening of an exhibition sponsored by the DWL Adopt Scheme. Exhibition works will include prints and drawings by Edward Armitage RA (1817-1896), some of which have been conserved as part of the DWL Adopt Scheme. Armitage's studies were drawings of sitters who were to form part of his once famous mural "The Vanguard of the Age" which decorated the walls of the lecture hall, then part of University Hall. The mural is now hidden under wallpaper as its deterioration was seen as too problematic to be restored. The lithographs in the exhibition are copies of the mural and allow us to recreate the complete work of art. Besides the opening of the exhibition the day's events will include a seminar about Edward Armitage RA given by Tom Saywer (see events). If you are interested in joining us or supporting the DWL Adopt Scheme and would like to receive further information please contact Jane Giscombe. The exhibition will run from the 18th May until the 18th August. Exhibition by prior appointment only.